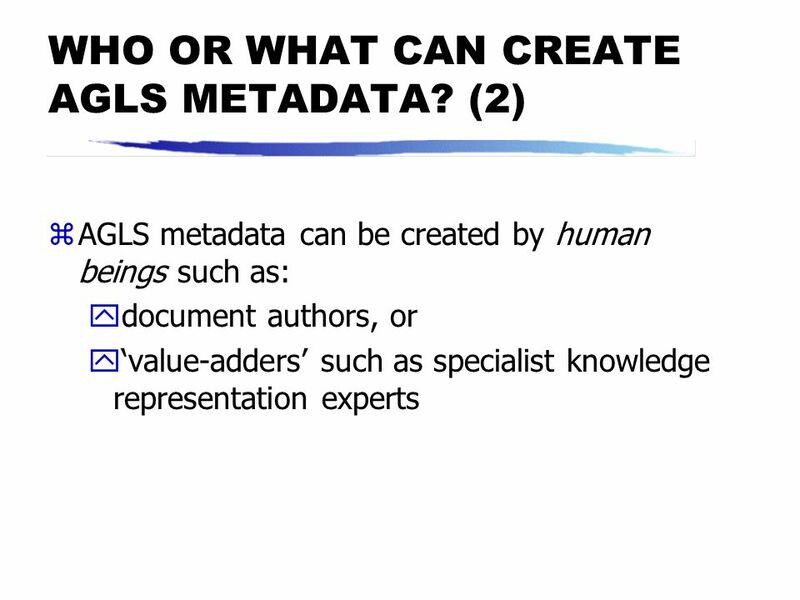 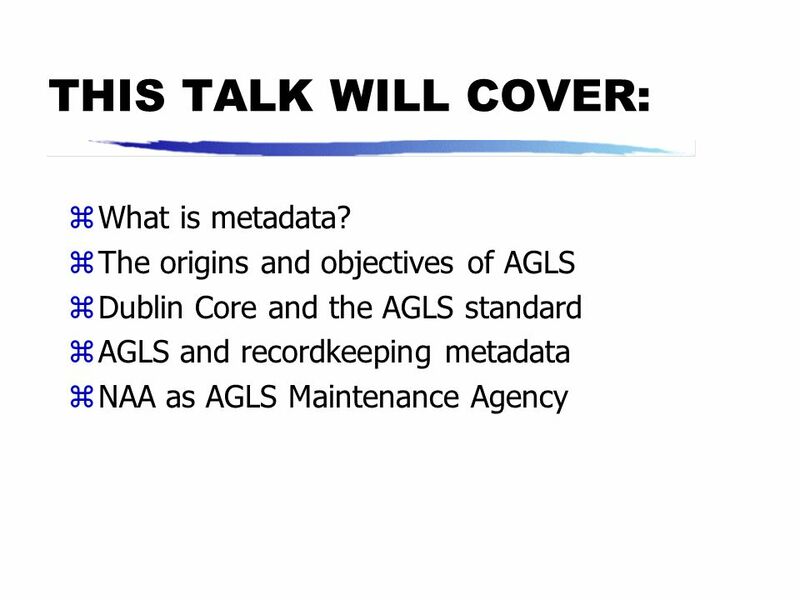 2 THIS TALK WILL COVER: What is metadata? 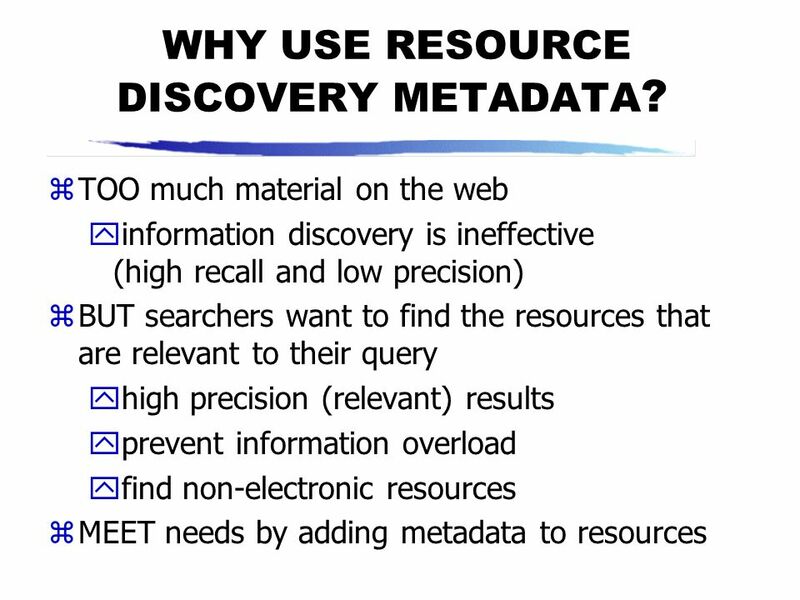 4 WHY USE RESOURCE DISCOVERY METADATA? 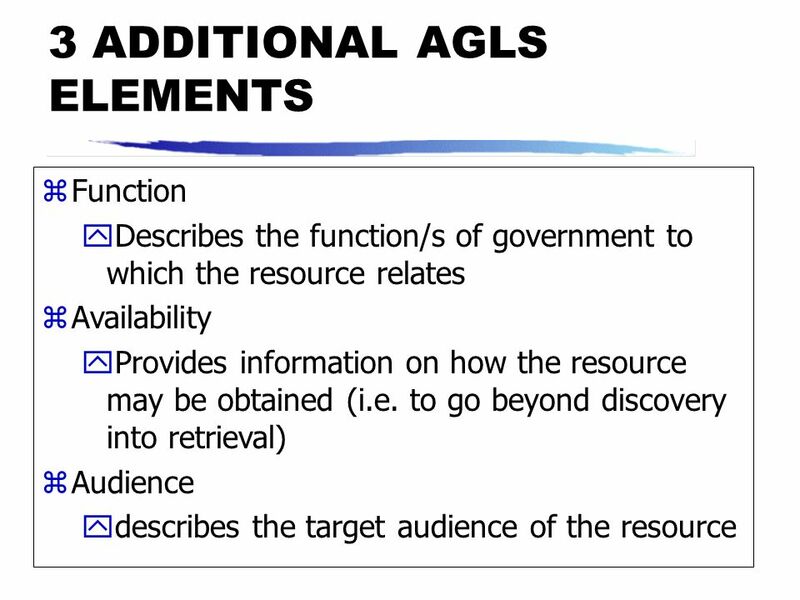 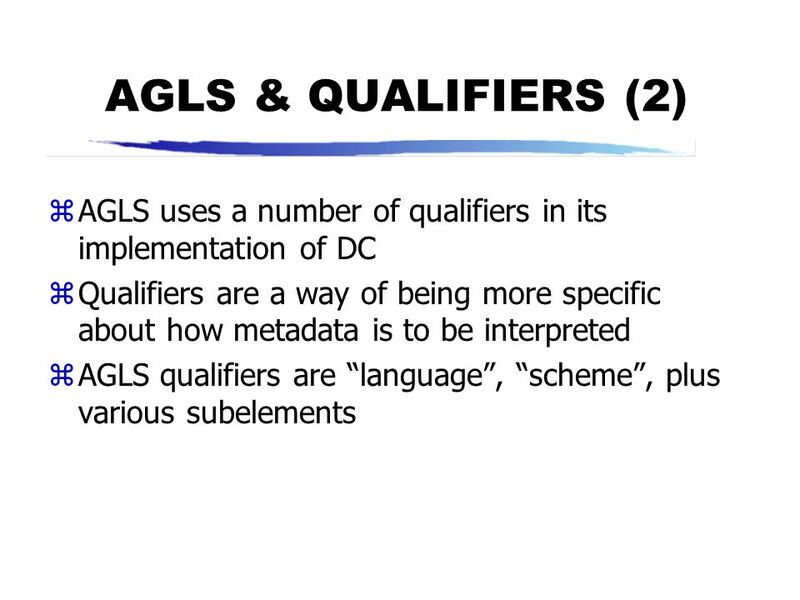 15 AGLS & QUALIFIERS (1) The current DC standard uses simple unqualified elements, e.g. 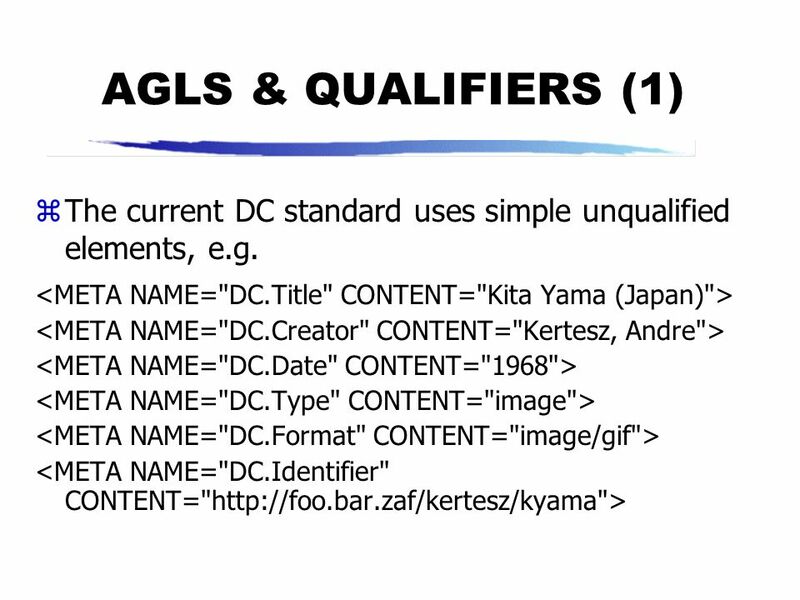 <META NAME="DC.Title" CONTENT="Kita Yama (Japan)"> <META NAME="DC.Creator" CONTENT="Kertesz, Andre"> <META NAME="DC.Date" CONTENT="1968"> <META NAME="DC.Type" CONTENT="image"> <META NAME="DC.Format" CONTENT="image/gif"> <META NAME="DC.Identifier" CONTENT="
21 WHERE CAN AGLS METADATA BE STORED? 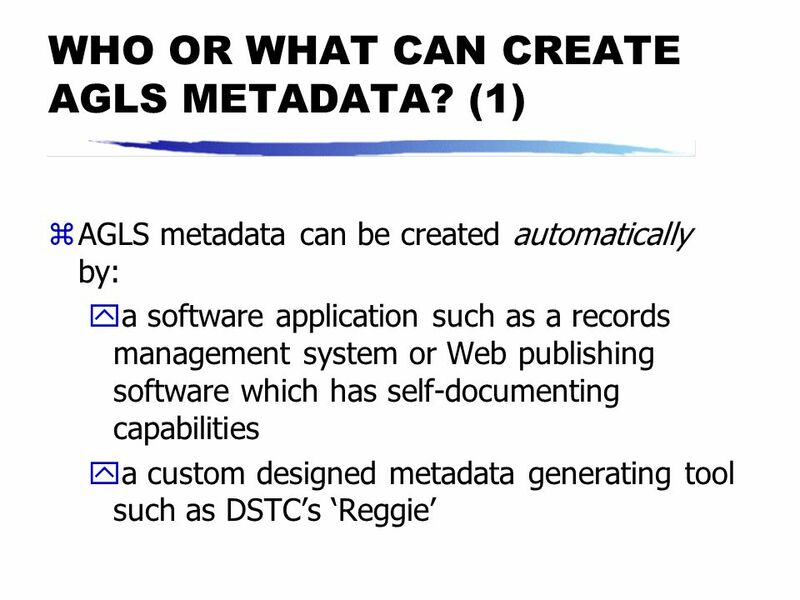 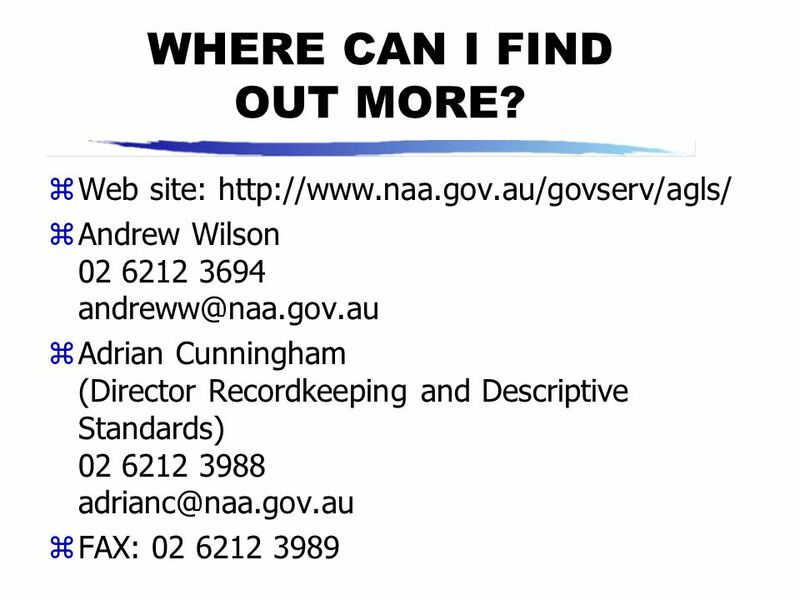 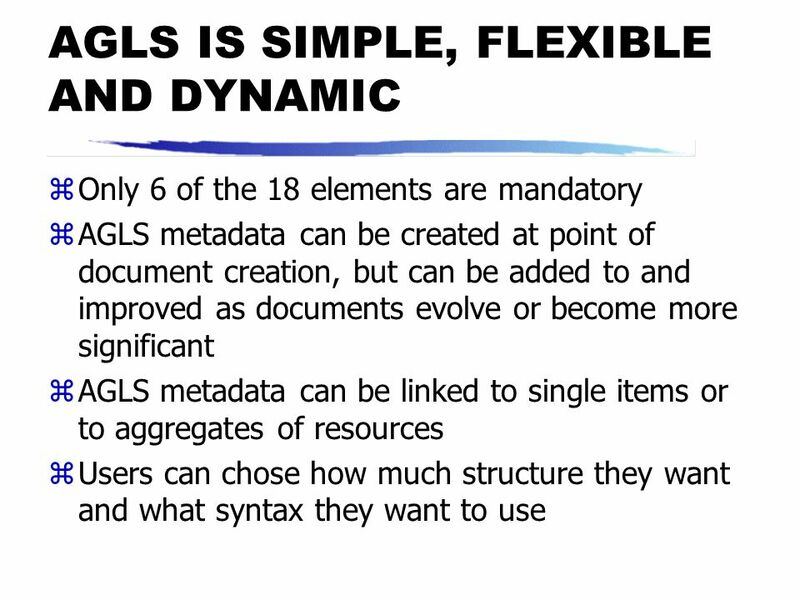 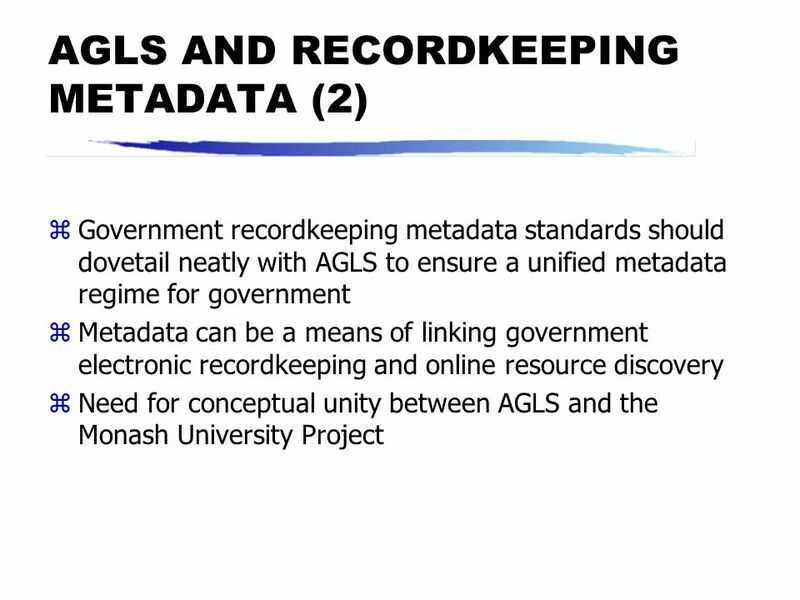 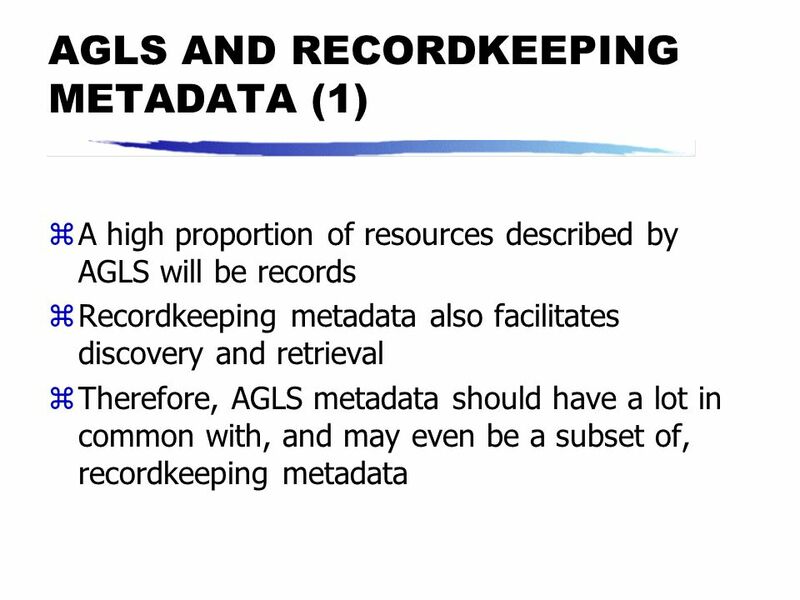 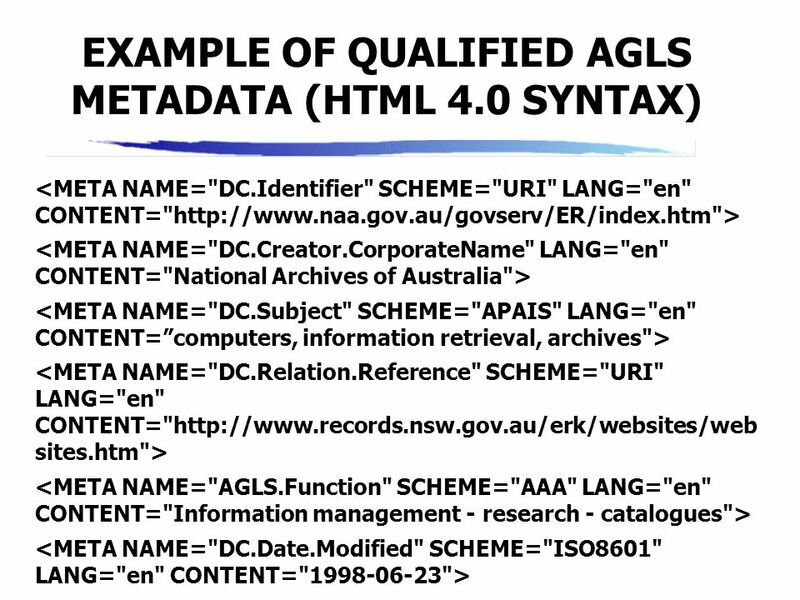 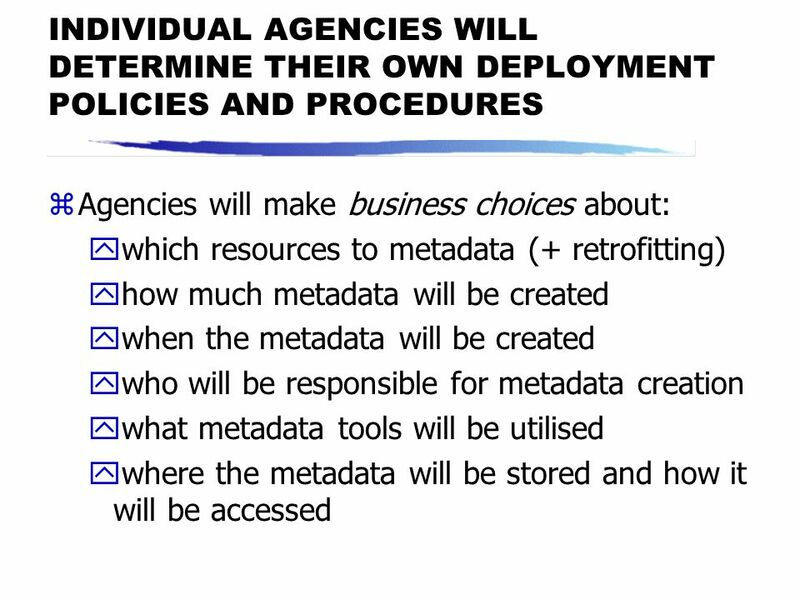 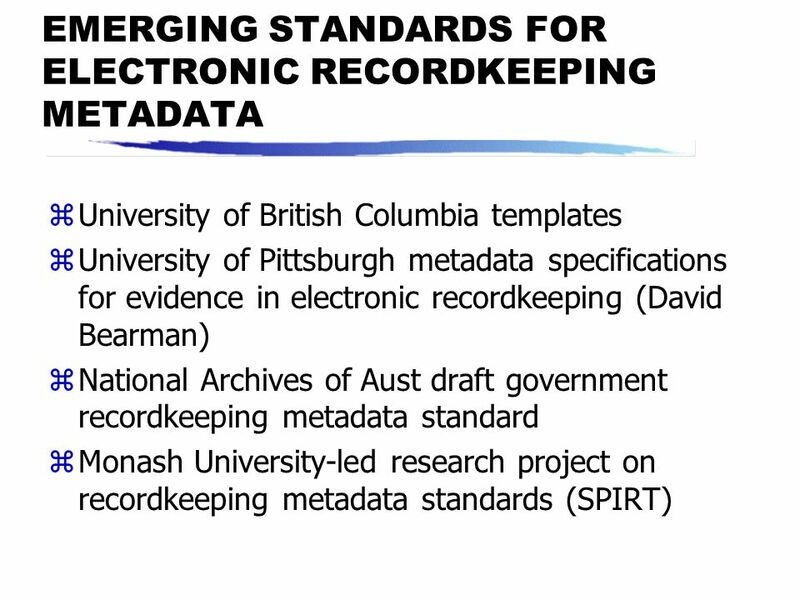 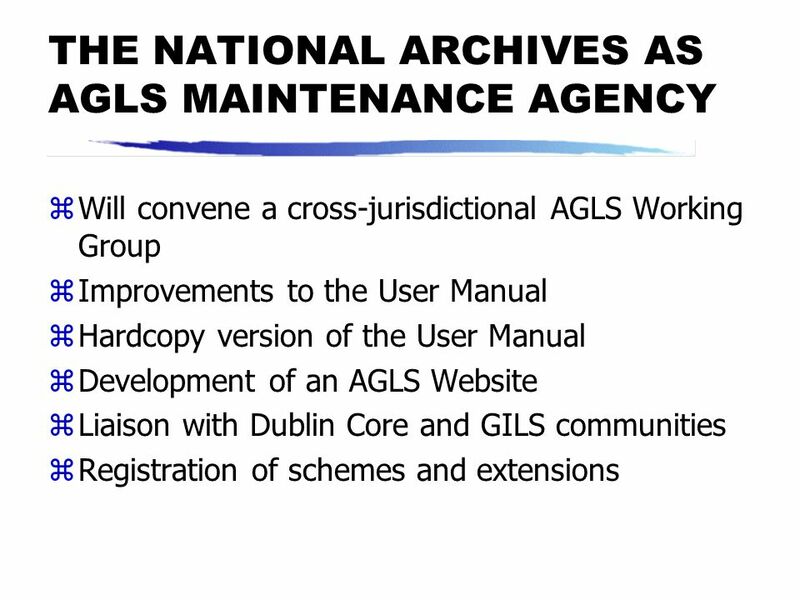 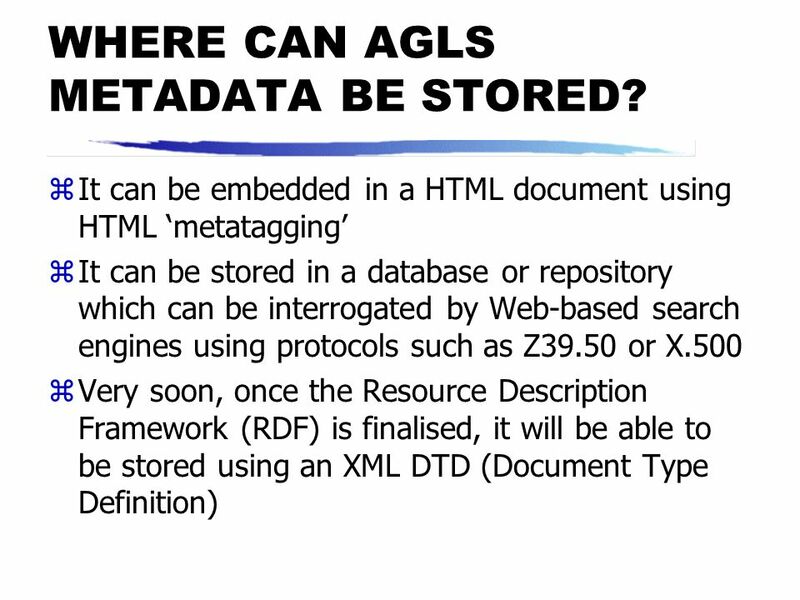 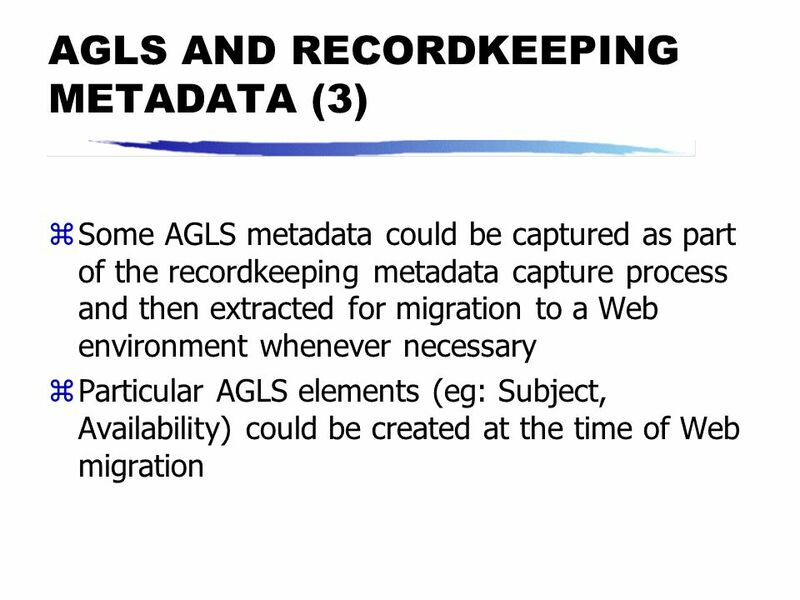 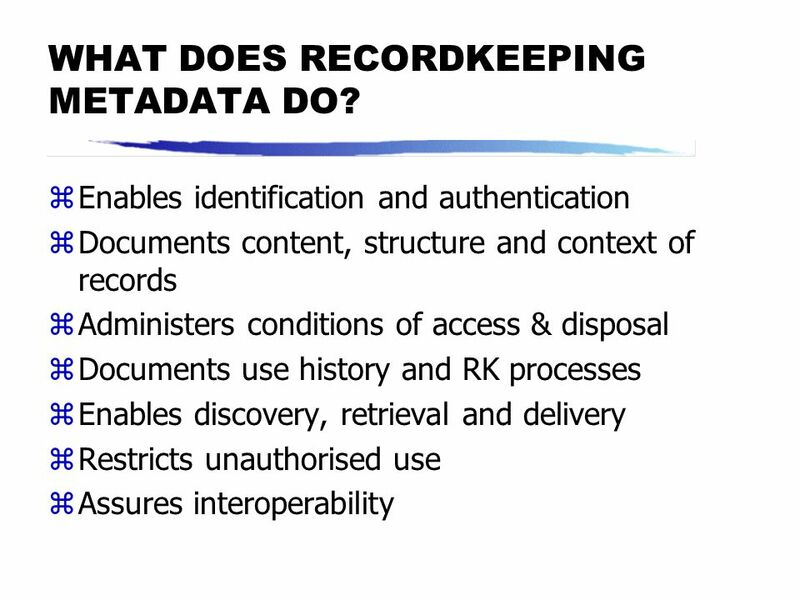 24 WHAT DOES RECORDKEEPING METADATA DO? 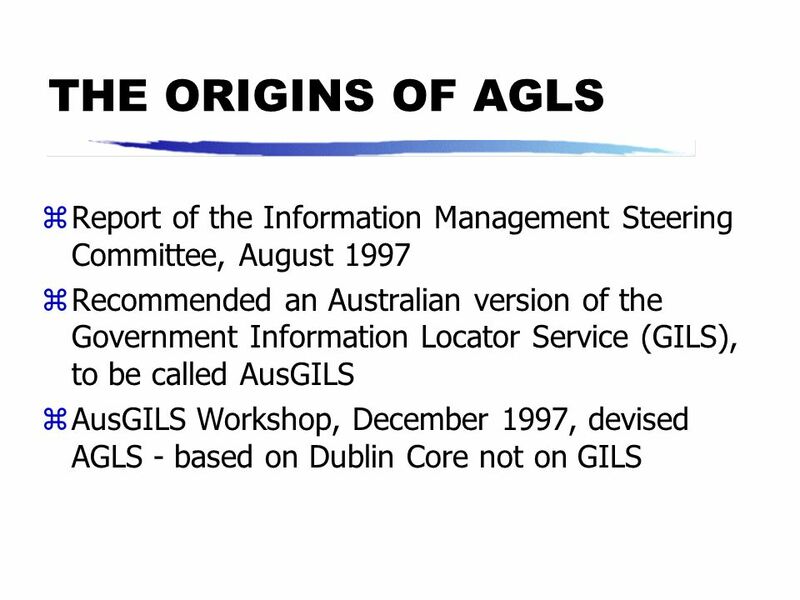 28 IS AGLS WORTH THE EFFORT? 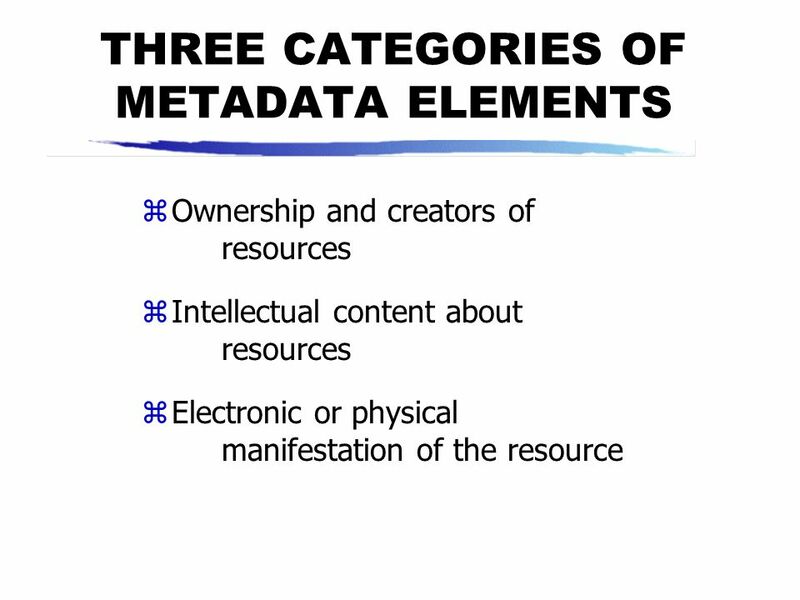 30 WHERE CAN I FIND OUT MORE? 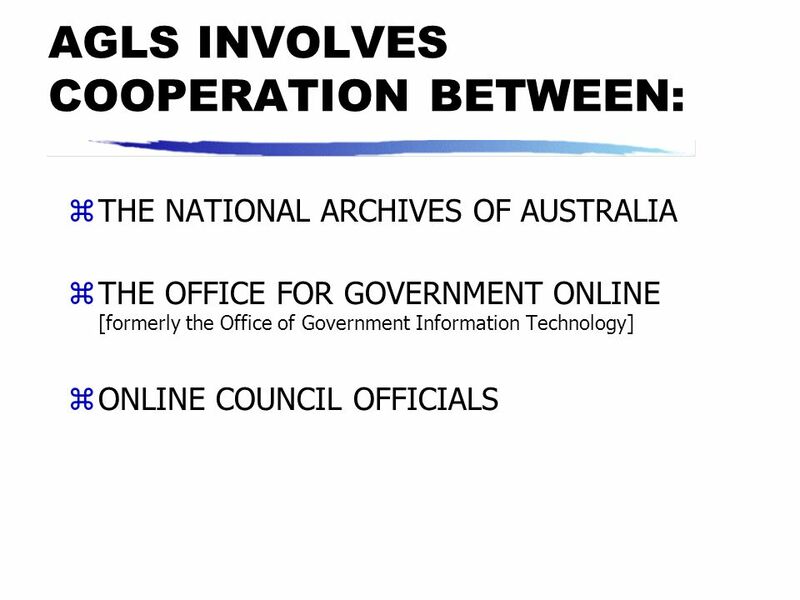 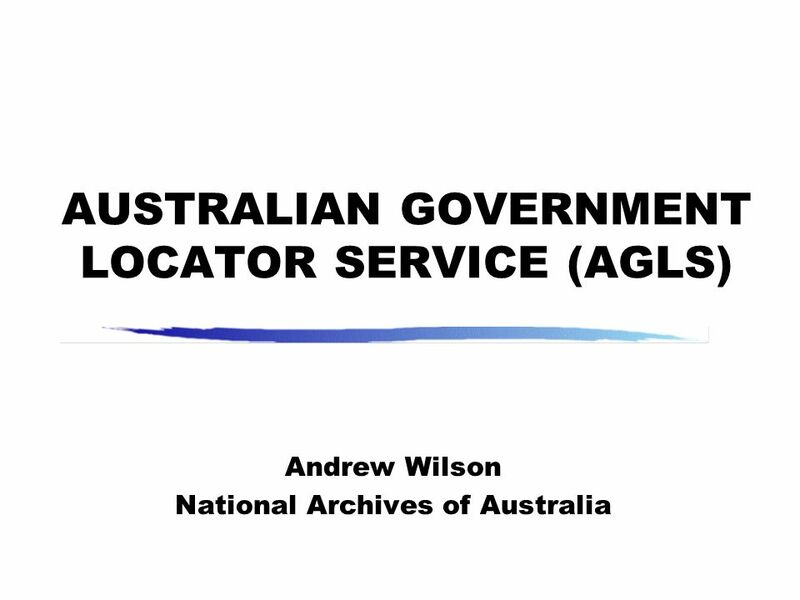 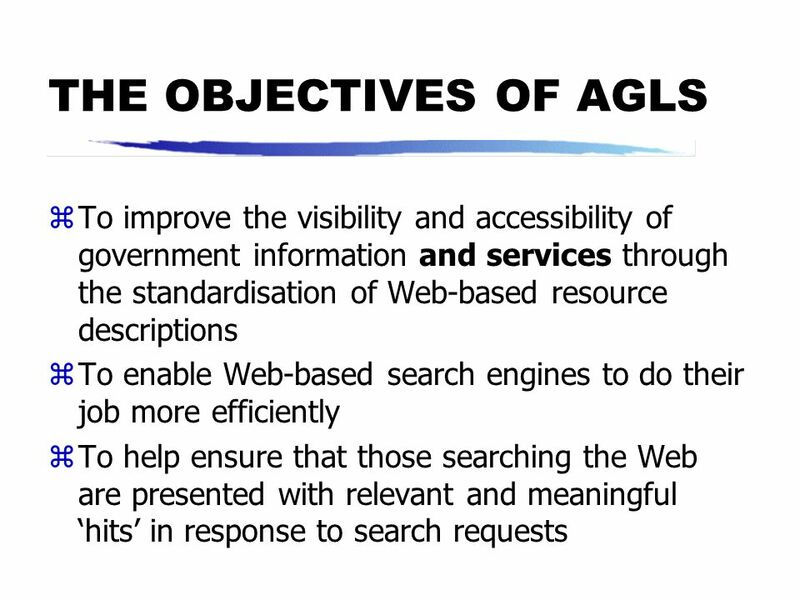 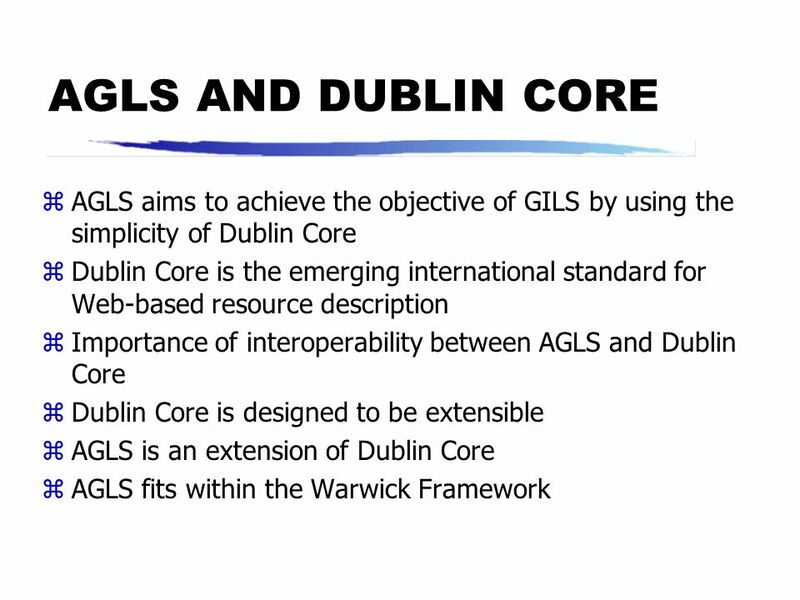 Download ppt "AUSTRALIAN GOVERNMENT LOCATOR SERVICE (AGLS)"
THE DONOR PROJECT Titia van der Werf-Davelaar. 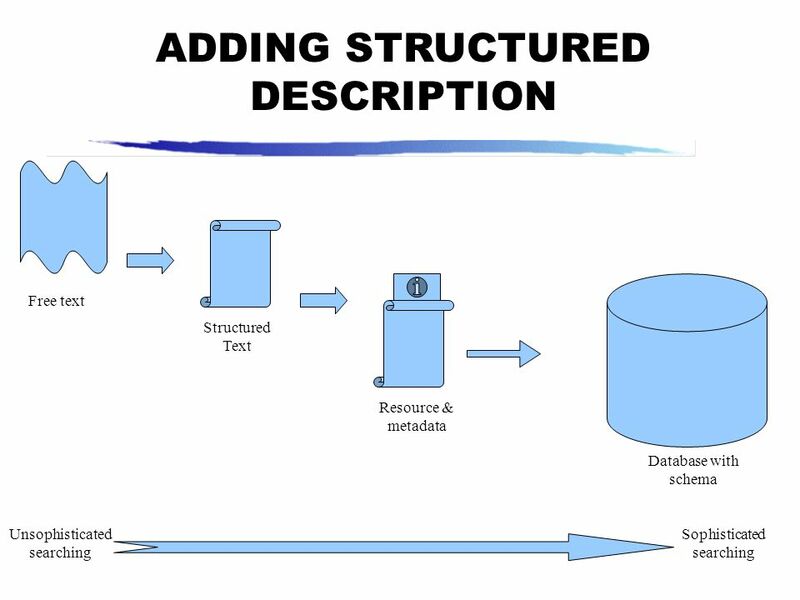 Project Financed by: Innovation of Scientific Information Provision (IWI) Duration: –phase 1: 1 may 1998. 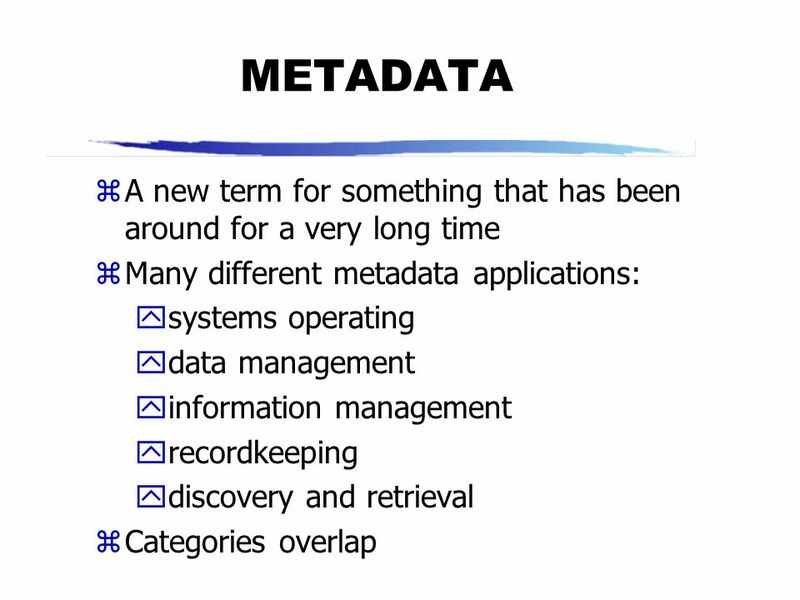 DC8 Ottawa, October 4-6, 2000 Rachel Heery UKOLN, University of Bath Application Profiles: managing metadata. 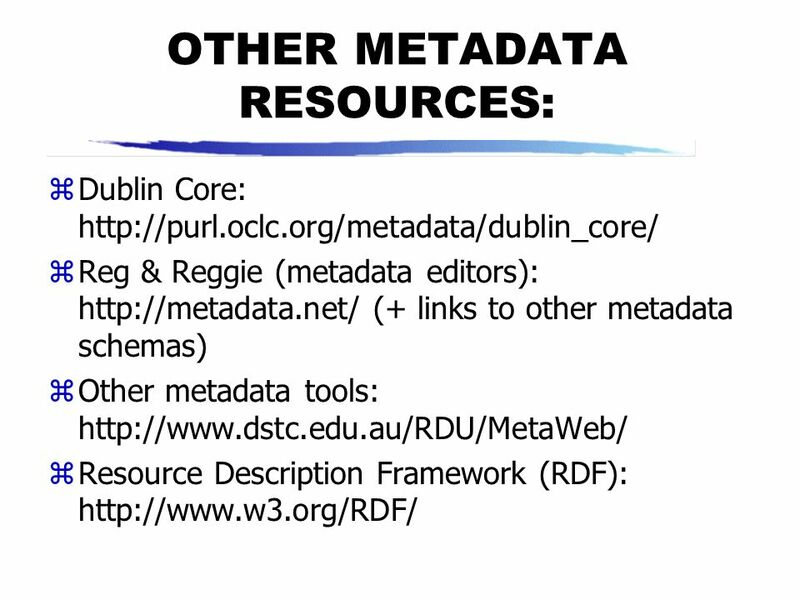 Australian Government Metadata Dr Renato Iannella DSTC Australia 6th Dublin Core Workshop Washington DC, USA, 2-4 November 1998. 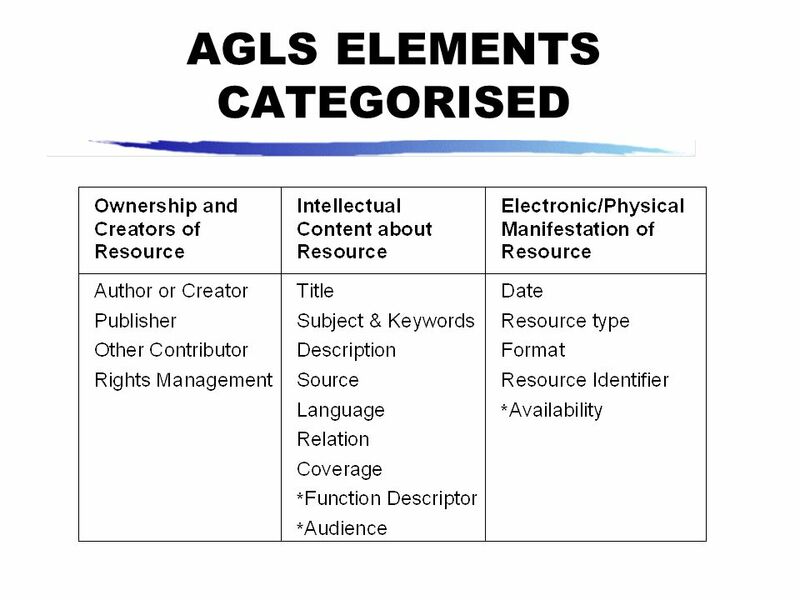 APLAWS Content Management System What is content? 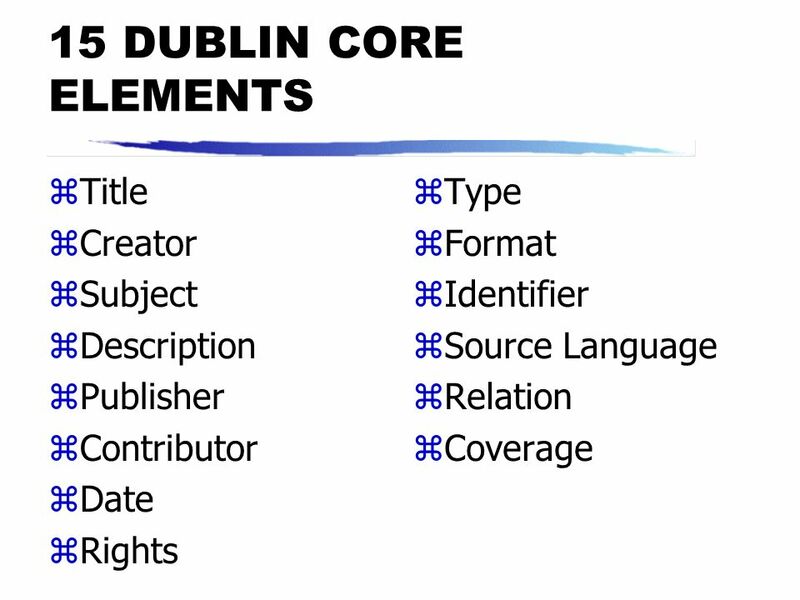 Content is a resource Content -articles -reports -pictures -audio - Call each of these a content. 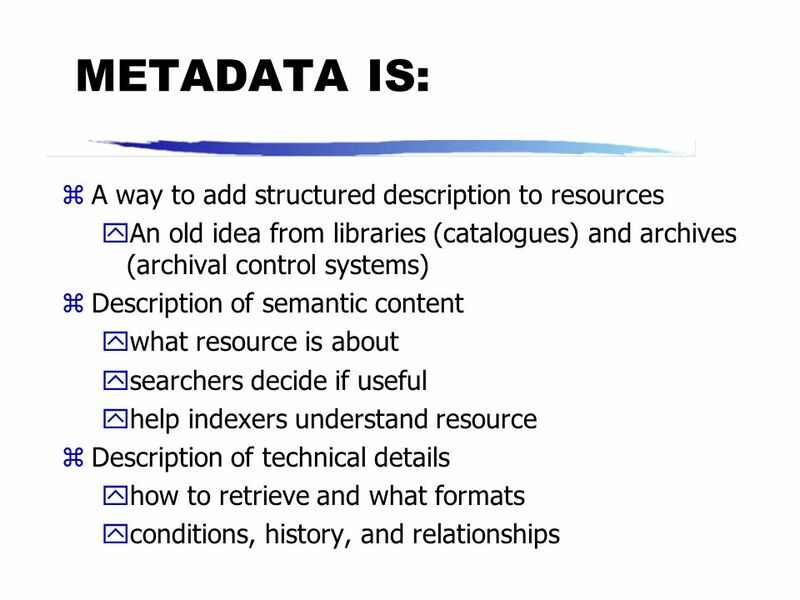 The PREMIS Data Dictionary Michael Day Digital Curation Centre UKOLN, University of Bath JORUM, JISC and DCC.